The unemployment rate under President Obama reached a new record high in September. The unemployment rate continues to rise even though the Obama Administration promised that it would not exceed 8% if the non-Stimulus Plan was passed. The unemployment rate rose to 9.8 percent in September as employers cut far more jobs than expected, evidence that the longest recession since the 1930s is still inflicting widespread pain. The Labor Department said Friday that the economy lost a net total of 263,000 jobs last month, up from a downwardly revised 201,000 in August. That’s above Wall Street economists’ expectations of 180,000 job losses, according to a survey by Thomson Reuters. The unemployment rate rose from 9.7 percent in August, matching expectations. If laid-off workers who have settled for part-time work or have given up looking for new jobs are included, the unemployment rate rose to 17 percent, the highest on records dating from 1994. More than a half-million unemployed people gave up looking for work last month. Had they continued searching, the official jobless rate would have been higher. All told, 15.1 million Americans are now out of work, the department said. Unemployment continues to skyrocket under the Obama Administration. 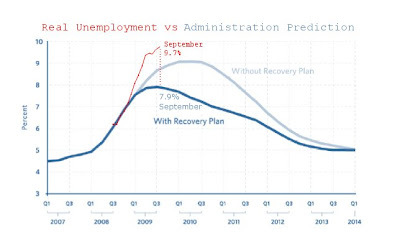 More… Obama repeated false unemployment numbers today.